Way of the Roses — Blooming Wonderful Artwork! 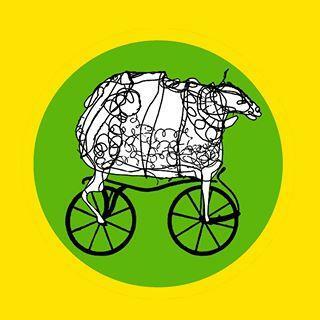 Planning a charity ride or had a memorable journey? Send us your story. It’s not only the new public art on display that makes the Bentham Loop such a worthwhile place for a detour off the Way of the Roses route. Coffee shops, bakeries, delicious eateries and take-aways, plus 3 pubs and a range of accommodation all combine to make this an attractive refreshment stop or overnight stay, especially for those of us who are doing the route in a more leisurely fashion. The Queen’s Bloomers, hanging above the river Wenning by the bridge in Low Bentham, is the first artwork you come to having been beckoned off the main route by the Fat Sheep on a Bicycle. 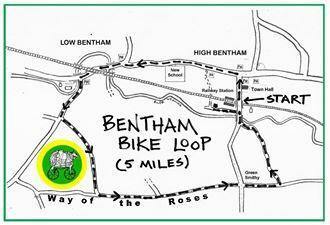 Look at the Bentham Bike Loop map for more details. It’s between mile markers 19 – 21 on the official Sustrans map on the edge of the Forest of Bowland AONB. The Bentham Loop is the first in a series of eye-catching Passing Places artworks which tell stories about people and places along the Way of the Roses route, and is part of a wider Travelling Histories public art project. High Bentham based Pioneer Projects have worked with the local community and Sustrans to create this Passing Place. You can stay in High Bentham at the Coach House or the Black Bull, or nearby at Halsteds Barn, New Butts Farm or Curlew Camping. See also the ‘Food & Drink’ page.